Is love really all you need? This book mines the complexity of romantic relationships that are a union of cultures as well as individuals, offering guidance and applied examples. Berlin and Cannon are marriage and family therapists who wrote this book, their first, as a reflection of issues that continually arose during their counseling sessions. “We’ve had countless conversations about how multiculturalism affects us and our clients,” writes Berlin. “We train other professionals on this topic, too, so it feels natural to extend these conversations into book form.” The guide, which Berlin explains was “written from the gut,” begins with the authors’ own stories of their multicultural backgrounds and comprises three main sections: an introduction to the terms and concepts that will be used, including collectivist versus individualist paradigms, acculturation, ethnocentricity and code switching; fictionalized first-person narratives of twelve different couples that offer illustrations of these concepts; and a resource section with a glossary, worksheets and suggested reading list. The material is enlightening, effectively outlining how varied cultural perspectives affect worldviews. The authors argue that many of us aren’t aware of how our cultural responses may differ from those of our loved ones, inspiring aha moments from readers who may not even think of their primary relationship as a multicultural one. The writing is intelligent but not academic, ensuring that the book will be as accessible to clients as to therapists, and some of the narratives are riveting. Particularly poignant is the story of Angie, from Chicago, and Francois, from Haiti. Angie grappled with life as a strong and modern woman in a traditionally patriarchal culture; Francois, with being black in America without being African-American. Berlin and Cannon rely heavily on these personal anecdotes, and they form the bulk of the book, reflecting their assertion that they are “clinicians, not researchers.” This statement may serve, too, as a disclaimer for those who might question some of their definitions: Some readers, for instance, may raise an eyebrow at the idea of individualist cultures being more dependent on governmental structure than collectivist ones. But, ideologically pure or not, their concepts ring true through the examples, giving readers much to think about and apply to their own real-world experiences. 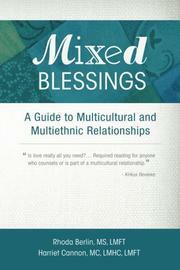 Required reading for anyone who counsels or is part of a multicultural relationship.